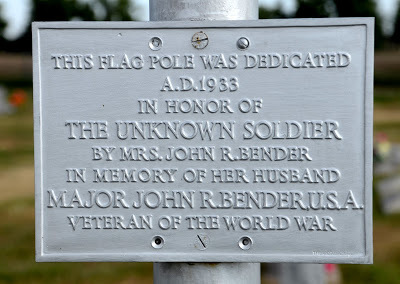 John R. Bender lived a remarkable life that made an impact on several college athletic programs early in the 20th century. A coach by profession, his lasting accomplishments are the things he did off the field. One of those things is giving the nickname “Cougars” to the University of Houston. 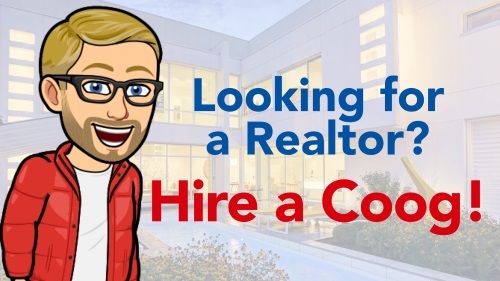 Bender grew up in the rural midwest in the late 1800’s and was a star halfback for the University of Nebraska after the turn of the century. He played on two undefeated teams (1902, 1903) and set a then-school record for points scored. In 1904, Bender refused to play at defending national champs Minnesota, insisting he be paid for the game. It was common practice for colleges to pay football players but Bender’s stand was not popular at the time. 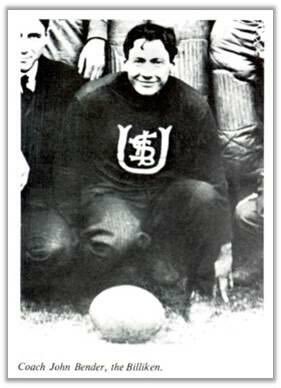 Known as “Chief” (Bender was of Native American descent), he began his coaching career at South Dakota State Normal School in 1905 and then became head coach at Washington State in 1906. At Wazzu, he posted a 13-1 record in football for the Cougars, a nickname he began to love. He also coached the Cougar basketball and baseball teams. He left Wazzu for Haskell Indian Nations University in Lawrence, Kansas, in 1908. Haskell was known as the “Powerhouse of the West” in college football. While in Kansas, he continued playing minor league baseball which he had started at SD Normal and continued at Washington State. He left Haskell after 2 seasons to become head coach at Saint Louis University. At Saint Louis, Chief gave up playing baseball and enrolled in law school, graduating with an LLM. The Billiken has a nice arm. The coach liked the name and officially gave it to the SLU squad. Today, the Billikens are the best oddball nickname in college sports. After two years at SLU, Bender headed back to Wazzu and spent 3 years in the Palouse (1912-1914), the longest uninterrupted coaching stop of his career. From there, he went to Kansas State Agricultural College in Manhattan, Kansas, for one season. 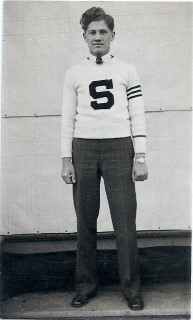 Bender gave the Kansas State athletics program the nickname the Wildcats – his second time to a name a school’s teams. The school gave up the nickname for 4 years after Bender left (in the interim, they were called The Farmers), they soon came back to it. Bender also instituted homecoming at Kansas State which has lasted for 104 years and counting. 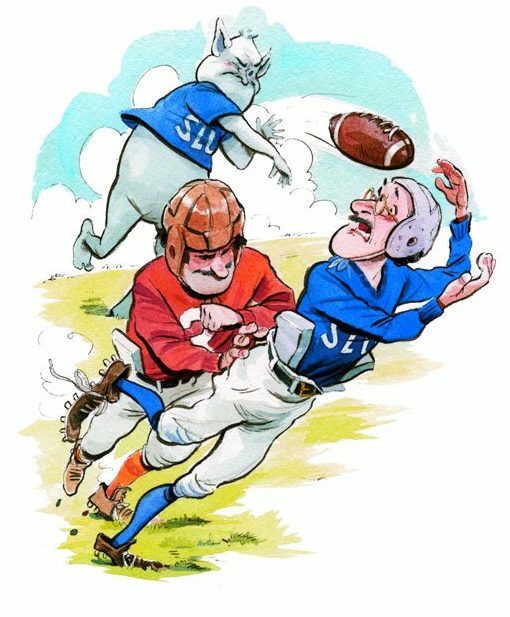 UH and Saint Louis share some history: Saint Louis gave up football in 1949 but their final game was against Houston (The Cougars won 35-0). The schools were both members of Conference USA from 1996-2005. After one season at K-State, Bender left for Tennessee at the same time the Tennessee coach headed to Kansas State. It was basically a trade. In Knoxville, Bender coached football, basketball, and baseball for one season before World War I interrupted his career. After the end of the 16-17 basketball season, Chief became a captain in the 360th Infantry and attained the rank of major by the end of his service. 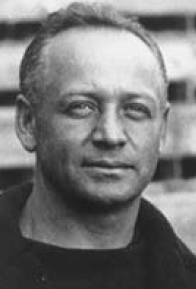 Bender went back to coach 3 more seasons for the Vols before retiring from coaching in 1920. The details are sketchy but sometime shortly after leaving Knoxville, Bender moved to College Station to teach at Texas A&M. He soon realized coaching was still in his blood and found his final stop in his career. Chief came to Houston to teach at the Houston Junior College and to coach a volunteer football squad. In 1927, as he had done twice before, Bender gave the Houston squad a nickname. He called them the Cougars in tribute to his two memorable stints at Washington State. After Bender’s mascot selection, HJC students named the new campus newspaper The Cougar. 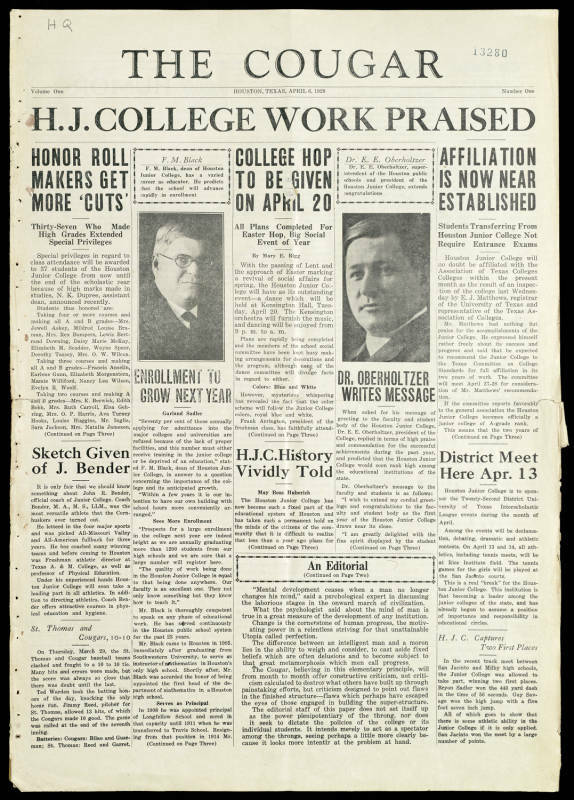 On April 4, 1928, The Cougar published edition Number One. The Cougar paid special tribute to Bender with a short article on the front page of that first edition. 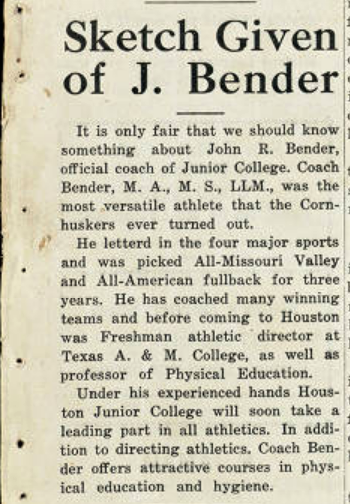 The blurb says that under Bender’s “experienced hands” the junior college would take a leading part in athletics. Sadly, only half of that sentence would be true. 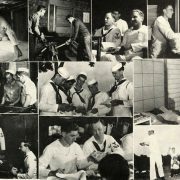 While getting ready for the new academic year and the upcoming season for his Cougars, Bender died July 24, 1928, at the age of 46. 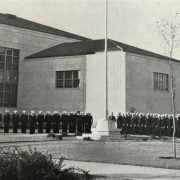 Despite his passing, Bender’s legacy lived on: The John R. Bender Dramatic Club began in 1931 as a tribute to the former coach. 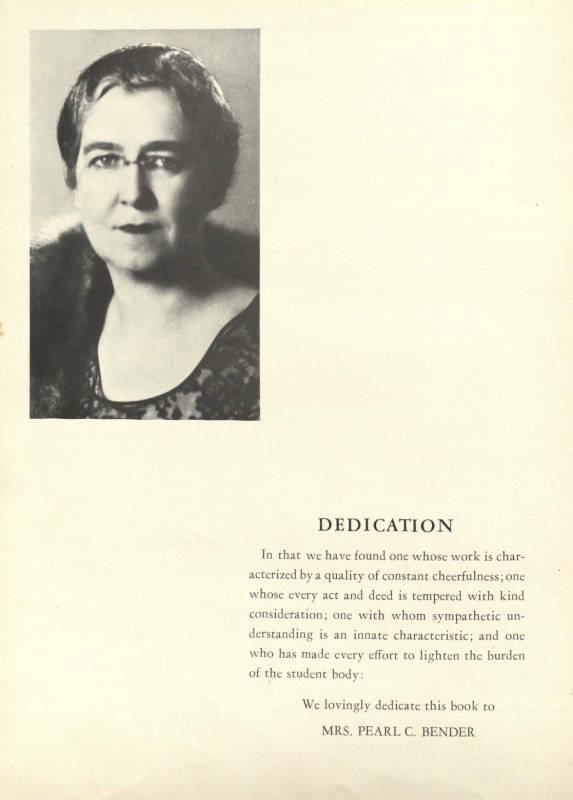 His wife, Pearl, remained at HJC and then UH for several years and was listed as registrar and Dean of Women. She also sponsored many clubs and organizations on campus. 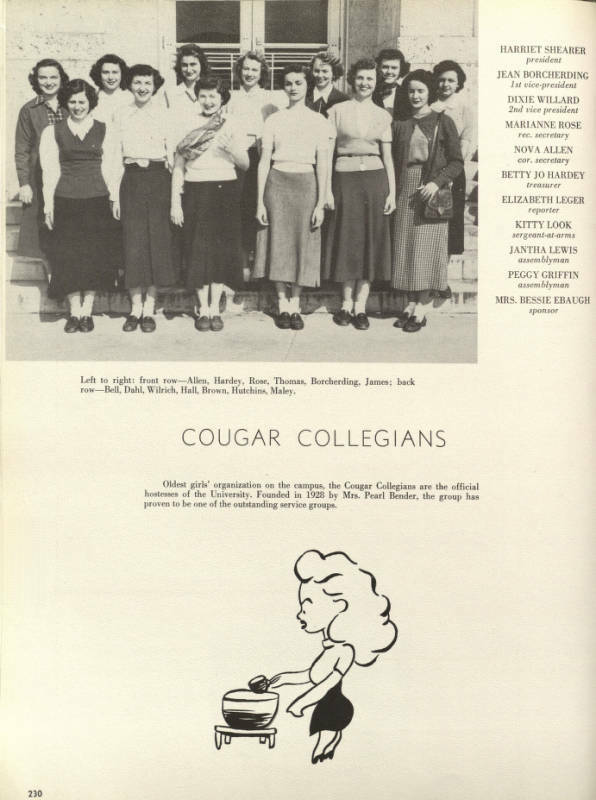 The year John passed away, she founded the Cougar Collegians, the first service club on campus. 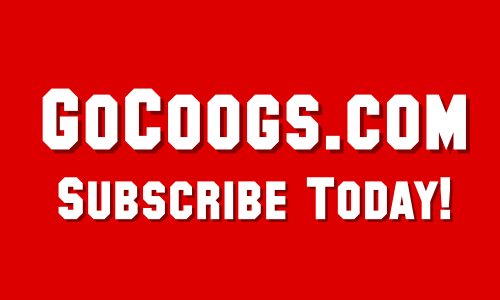 Some might say it’s just a nickname but the Cougars have played a major role in the psyche of the University of Houston. It was Bender’s work at Washington State paved the way for the nickname we all love today. John R. Bender would love that the Cougs and Coogs have played 3 times in football: in Houston in 1959, in Pullman in 1966, and in Honolulu in the Aloha Bowl in 1988. In 2019, UH will play Wazzu in the 60th anniversary year of our first meeting. But to Houston fans, the two schools really first met in 1927 thanks to the Chief. 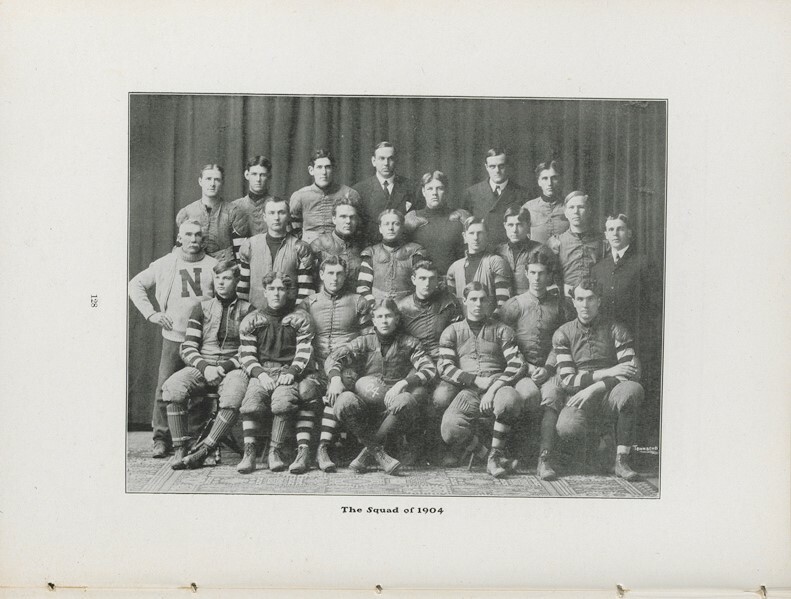 The 1904 Nebraska Cornhuskers. Bender (1st row far right) was team captain. 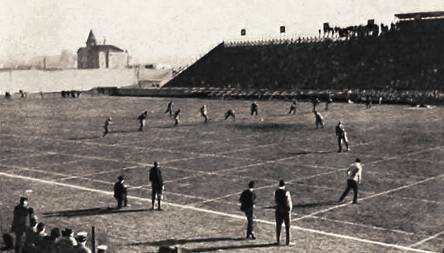 The 1904 Minnesota game Bender refused to play in. 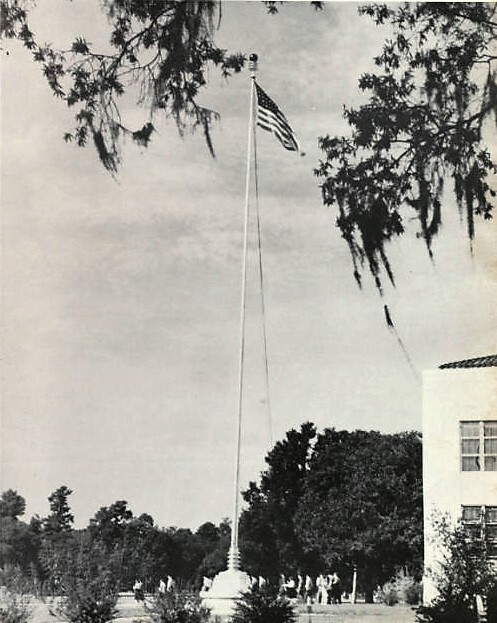 The Pearl C Bender flag pole was dedicated on campus in 1940.